Healthy whole grain, sugar-free and gluten-free profiteroles, cream puffs or eclairs without the guilt! 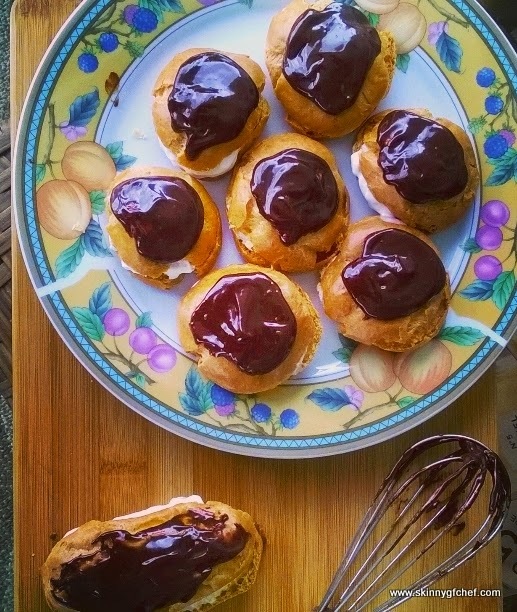 Come see how easy and fun it is to make a good for you Pate a Choux! I tested this recipe three times and I cannot tell you how much I adore these gluten-free cream puffs! 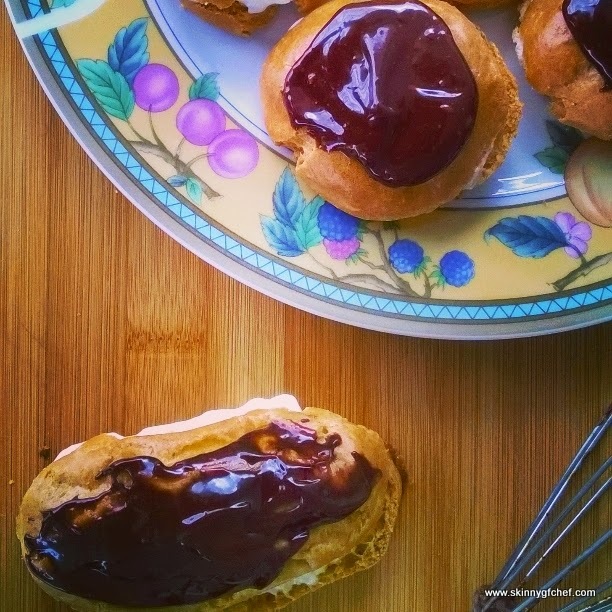 Besides the fact that I hadn't tasted an eclair or cream puff for almost 5 years, and they taste just like what I remembered, this nutritious Pate a Choux is so versatile. I make them into little sliders for lunch and guilt-free desserts with the yogurt cream filling you will find below. One, it's not hard at all! Anyone can do this. Two, you just need to follow the simple classic Pate a Choux instructions. Ok, I'll fess up. I didn't follow the instructions in my first try and they still worked! I boiled the water, threw in my flour mixture, beat it with a wooden spoon until it came together into a ball and forgot to add the butter. Yikes, so I added the melted butter, threw it all in the stand mixer and beat it together. It was just fine. Three, don't rush. Add the beaten egg to the cooled (it can still be a little warm) dough very slowly and beat until fully incorporated after each addition. This is important. Four, that little bit of water on your finger will give you a crisper crust. And last tip, don't open the oven door until they are golden brown and don't under cook them. I found leaving them in the turned-off oven really made a difference. See the example below of my nice crisp Pate a Choux with a dry interior. 1/2 teaspoon xanthan gum, (sub-try ground psyllium husks or guar gum) or try without. Instructions: Preheat oven to 400 degrees F. Cover a large baking sheet with parchment paper or grease well. In a bowl, combine the dry ingredients and set aside. In a heavy bottomed medium saucepan, add the water and butter and bring to a boil. Dump the dry ingredients into the pan all in one dump and stir briskly for a minute with a large wooden spoon. Reduce the heat and lift the pan off the burner as you beat for another minute. Return to burner and beat until dough comes together in a sticky ball. Turn the dough ball into the bowl of a large stand-up mixer fitted with the paddle attachment. Beat on low to cool the dough for several minutes. Increase the mixer speed to medium and add one tablespoon of the beaten eggs, mix until smooth and keep adding until gone. This takes some patience so don't rush. Watch your dough and if it's getting runny don't add the rest of the eggs. The dough should look thick, smooth and elastic. It should drop from the paddles with a push of your finger. Drop small round teaspoons of dough onto prepared baking sheet, leaving an inch between for expansion. Dip a finger in water and lightly smooth each top. You can also use a plastic bag or pastry bag with a small hole. Bake at 400 degrees F. for 10 minutes. Reduce the heat to 350 and bake for 30 minutes or until golden brown. Turn the oven off. Crack the oven door for several minutes. Pull out one choux to see how it looks inside. If it's still a little sticky, close the oven door, with the heat off and leave the shells in to dry out for appx 15-20 minutes. Slice and fill with favorite filling and top with chocolate sauce or powdered sugar. In a small glass bowl, add the chocolate and milk. Microwave for one minute or until just melted. Whisk well until smooth. Add a tiny bit more milk if too thick. Spoon onto pastries. Whip up heavy whipping cream with a little stevia or cane sugar. Add fruit zest or gluten free pure extracts of choice. Add 1/4 cup regular or sugar-free instant pudding to 1 cup plain Greek yogurt and whisk. Chill to set and stir. Or fill with meat and cheese of choice for a savory snack! Extra shells can be frozen or refrigerated. To re-crisp, heat in 350-degree oven for several minutes.